Hello and welcome to Day 4 of our November Digital Stamp Release Showcase! On Thursday (1st November) Whimsy Stamps released this month's new digital designs, From then until 4th November the Whimsy Digital DT and Special Guests are showcasing these fabulous new goodies with a daily mini blog hop and I am part of today’s hop! Each mini blog hop has a new release prize hidden somewhere along the way and you have 24hrs to enter each prize draw. To be entered into today's mini blog hop prize draw, be sure to leave a comment on ALL of the DT's posts listed below by 12.00PM EST tomorrow. All winners will be announced on the Whimsy blog on 5th November. Wow some crazy winter weather last night, I hate when it gets cold then warms up. That's when we always get frezzing rain, And we got alot of it last night. My driveway and steps are like skating rinks. My front step has at least a half inch of ice on it if not a little bit more. It was raining just like summer then dipped down to get just a bit too cold. So today hopefully warms up enough to help get rid of it. So this is the card I made for day 4 of the digital release for Whimsy. This is an image from Lia Stampz called Annie. This image is a wonderful winter image that instantly made me want to color her and make a unique card. A month ago I went to visit family that is moving to a new province, I don't have a local scrapbook store any more so to be able to go to one is a real treat. I found this really neat little store with lots of different things in it - I stocked up. So I used some stuff on the last couple cards I've created. This is a new spellbinder I found at the little store, that I fell in love with. 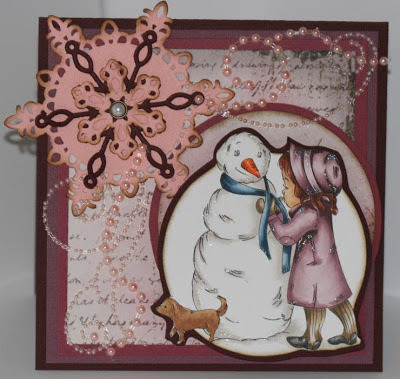 Supplies: Digital image from Whimsy Stamps called: Annie, Copic markers, Bazzill Cardstock, Fab Scraps patterned paper, Prima Marketing Pink Pearls, Spellbinder 2012 Snowflake Pendant, Distress ink, Stardust Stickles. Glad to see you, hope you pop by again. What a beautiful card - really love the pink snowflake. What a darling image...love your colors!! LOVE your card! 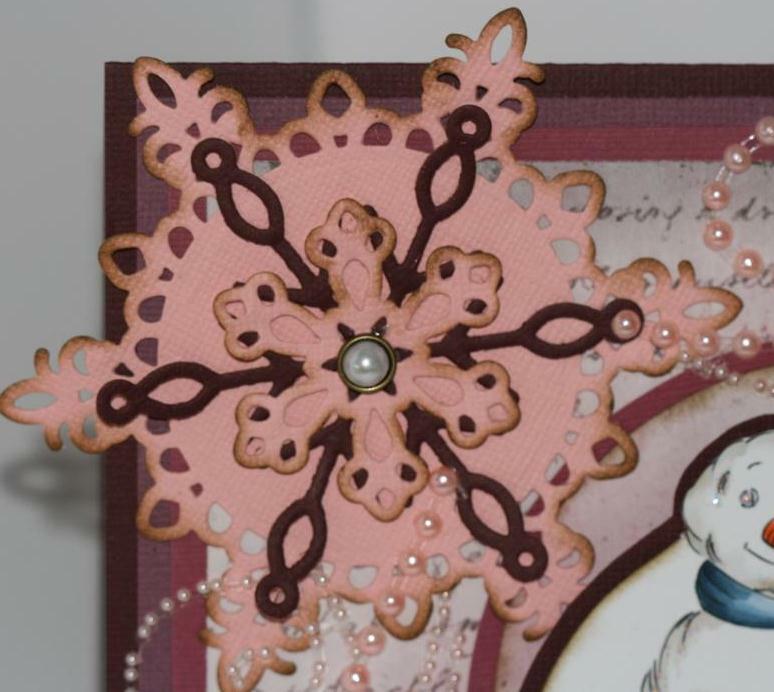 Love the pink snowflake! Love the snowflake die, great image and the pearl swirl awesome touch! Hi Charlene. Making my rounds to visit all the old and new Whimsy girls and see what everyone is up to. This is a great card with gorgeous colouring. Love that big snowflake too.